My children’s favorite joke goes something like this: Q-How many kids with ADD does it take to put in a lightbulb? A-Let’s go ride bikes. They like it, to some extent, because it is true of their mother. You’re about to find out just how true. 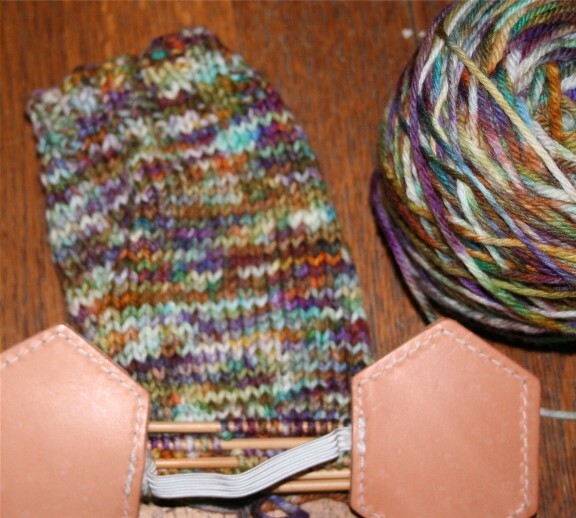 I decided I needed to ‘fess up to all the knitting projects I have started. This will NOT include planned projects, like Teddy’s sweater (waiting on just the right pattern) or my Koigu mittens (waiting on needles). 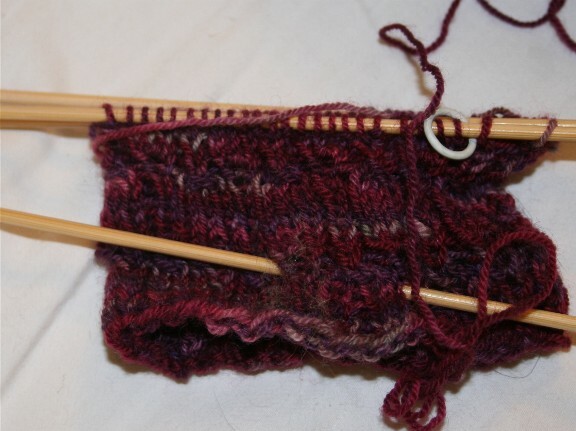 This is only actual, in progress, knitting. I would go oldest to newest, but that would make it clear what a totally deranged woman I am be too depressing, so you’re getting them in random order. I’ve been dying to make this hat ever since I saw the pattern. It’s perfect for waiting for Ellie at Nutcracker rehearsals. 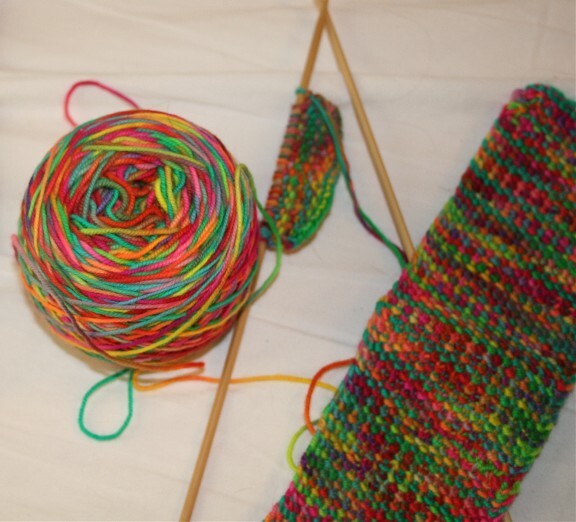 I got no further than casting on, when I realized my circulars were too long and my new Knitpicks Option needles, for some unknown reason, don’t include a 16" cable. Must run by the knit shop and get Addis. Why don’t pictures of this yarn ever look as pretty as the real thing? 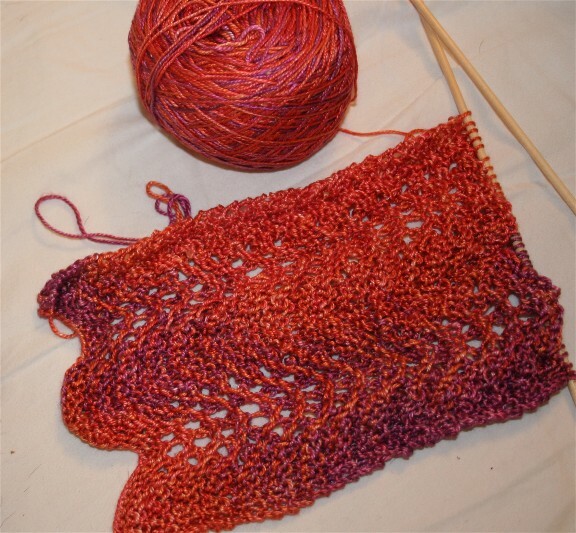 This is my Handmaiden Seasilk Scarf, being knit in a basic feather and fan pattern. I love this scarf. It’s for a dear friend who I don’t get to see enough of. I’m really enjoying this one. It’s a simple, relaxing knit. But I do need to remember to put in a lifeline because I’m sure to screw up the pattern at some point. The Rock and Weave sock. I love this sock. I love the yarn and I love the pattern. Maybe this sock and I need to have a mental health day at the Botanical Gardens? Hmmm…..I didn’t even want to include this, but it is true confessions day. This is some of my first handspun yarn. 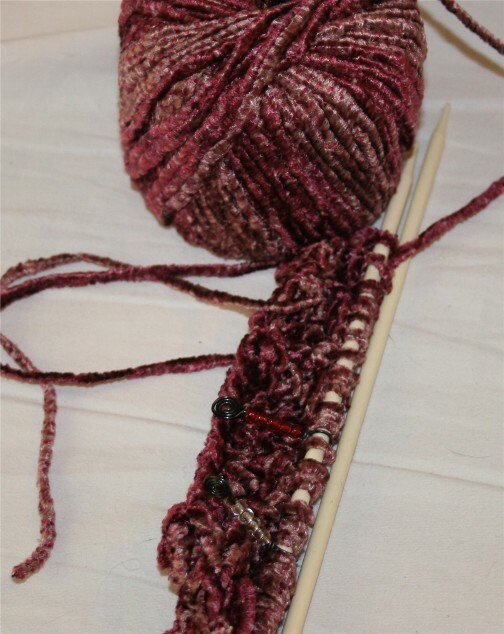 I was just fooling around and decided to knit with it. Silk, Merino, Corriedale. It’s all there. What is this? Memory’s Cabled Purse. I loved this when I saw it. But, the pattern has errors and I haven’t been able to get a corrected pattern from the store that wrote it. I think I’ll try driving out there this week, and if I still can’t get it, I’ll look around for a substitute pattern. A kitten for my niece. How pathetic is this? All I have to do is stuff it and sew it up. She’ll probably be 12 before I finish it at this rate. Undulating Rib socks in my own Purple Rain Blue Faced Leicester yarn. I really don’t like the yarn in this pattern. Actually, I do, but this is one of those patterns that requires more concentration than I can give a sock with a four year old on my lap. What I don’t like are the mistakes in the pattern. 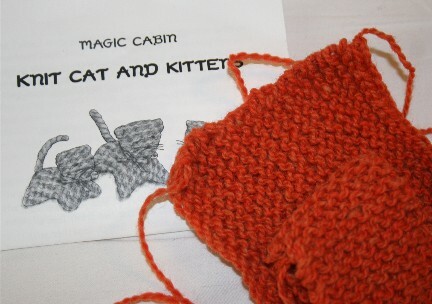 I’m going to frog this and give it a try in Knitty’s Monkey pattern, which I think will be easier to memorize. Vintage Velvet in Muench’s Touch Me. Need I say more? I need to go down one needle size and they’re in the mail, although I should have gotten them last March when I realized I needed to go a size down. Socks for Ellie in superwash merino. I’m hoping to work on these some this week. I’m in love with watching the colors knit up. Ew. Yucch. 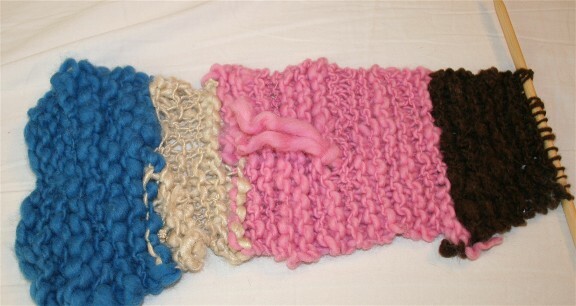 It’s Lion’s cashmere & gauze ribbon scarf. I thought it looked great in the picture. I’m less than overwhelmed with it in person. In fact, it’s off its needles and on a holder. I’m not sure the outlook for this one is good. The picture seemed so romantic and pretty. The reality seems like overstuffed Victoriana, and not in a nice way. Lizard Ridge (from Knitty). It calls to me. It’s a siren song. The pattern seems designed for surviving endless ballet rehearsals with Miss El. I’m planning on digging into this one with a vengeance, as rehearsals have now started and I have lots of Noro stashed for it. Finally, and currently missing in action, is Ellie’s Cahaba River Jacket. It’s almost done, but it needs to be lined. Donna, who wrote the pattern, has taken pity on me and has the jacket and fabric to cut out and serge the lining for me, so I can knit up the neck bits and line the jacket. It’s going to be adorable on her and I can’t wait to finish it. So — that’s true confessions from me. I challenge all of y’all to do the same! Confession is good for the soul. And it doesn’t seem as bad as I was afraid it would be. 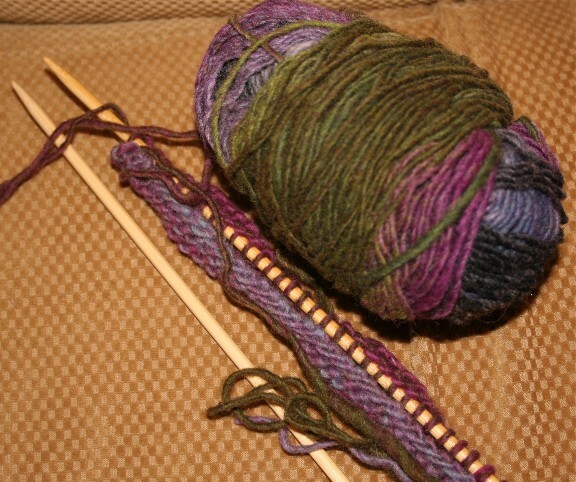 In fact, I think I’ll go cast on a couple of sweaters I’ve acquired yarn for and have been planning…. If you find yourself bored and in need of a yarn fix this week, please stop by my Hyena Cart store at http://www.hyenacart.com/elliebelly . I have a week long fairytale-themed yarn stocking going on, it starts on Monday at noon. There are lots of new colorways, inspired by my favorite stories. I’ve been working on these yarns for the last six weeks and am excited to be offering them, so please drop by for a look. There is cashmere, blue faced leicester, merino, silk, alpaca — a little bit of everything. Come check it out! I’m so glad there is someone out there with as many unfinished projects as I have and that I’m not the only one with ADD. I couldn’t list all my unfinished projects because I’m in heavy denial about how many there are. You are a crazy knitter! I love to watch your projects come together. Your yarn selections are just delicious!! I love the tank you knitted. I think you look beautiful in it! Joyce, maybe you should consider frogging those projects you’ve totally lose the love for. I did that recently and it was such a relief! 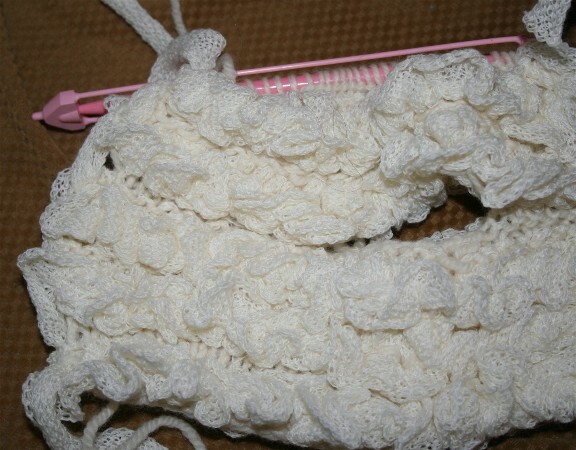 And if the cabled purse pattern came from M.H. in Vestavia – good luck! They’re open for 12.5 minutes on rotating Thursdays every other month. Or something like that. So many projects. So little time. Good luck with all of them. Lovely and very creative work. I love the tiny kittens. I have never seen them knitted! At least you can see all of your works in progress. I have so many things half-finished and stored away in bins. Oh boy, can I relate to the ufo’s. 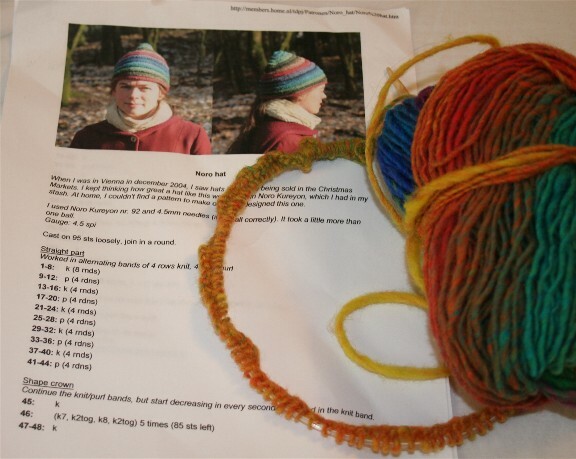 Hey, you can continue knitting the hat with a long circular. Its the magic loop method. If I can do it, you can do it. ahhh, joyce…you totally made me smile! you are like me with sewing projects. i’ve got cuts of fabric everywhere, and for some projects i have no idea what they were for.